Raphael Abraham Frank Mensah (1924-1990s), a schoolmaster and theologian, played a foundational role in bringing Mormonism to Ghana. Born in 1924 in Winneba, Gold Coast, as the British colony of Ghana was then called, he was the eldest of five children, three sons and two daughters. Mensah experimented with a variety of religious faiths. He attended a Catholic secondary school, lived with a Muslim uncle, and then joined the Methodist and later the Seventh-Day Adventist Church. He became an “International Evangelist” for the Seventh-day Adventists and served as headmaster for the Church’s Ghana Empire Secondary School. Though he represented the Seventh-day Adventists throughout West Africa, he also joined the Brotherhood of the Star and Cross, an indigenous Christian group originating from the visionary experiences of its founder, Olumba Olumba Obu, whom Mensah visited to receive counsel. According to most accounts Mensah came into contact with Mormonism in early 1964 through Lillian Clark, a Sufi mystic living in St. Agnes, Penhalls, United Kingdom. Clark had met two Latter-day Saints missionaries, Loretta Johnson and Karen Nelson, who introduced her to Church teachings. Clark later shared the teachings with Mensah who brought them to Ghana when he returned home. One of his first converts was Joseph William Billy Johnson. By 1964, Mensah, Johnson, and another convert, Rebecca Mould collaborated to establish a working, but unofficial, Mormon organization based in Accra. 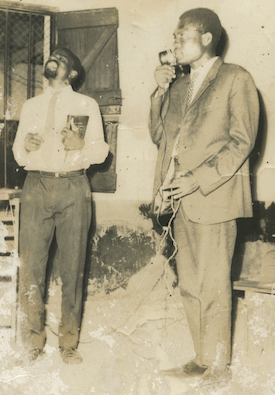 In 1969, they had garnered several hundred converts and new leadership. Mensah retained control over the faithful in Ghana from the capital, Accra, while Johnson moved to Cape Coast and Mould moved to Sekondi-Takoradi to spread LDS teachings. Mensah imported Mormon teachings into other facets of his life, teaching members of the Brotherhood of the Star and Cross from the Book of Mormon. In 1967 Mensah and Johnson established in Accra the Brigham Young Educational Institute which enrolled approximately 50 children. They based their school on the colonial model of education, including classes in English, French, and Religious Education. Mensah mixed his new faith with business dealings. From 1969 to 1972, he sought to establish business and educational relationships with prominent Mormons such as Charles Allen, an oil exporter in Maderia, California and Brigham Young University professor, Virginia Cutler and University of Utah professor Neff Smart who were visiting Fulbright professors at the University of Ghana. In 1972 one of Mensah’s followers, Matthew Koomson, led a revolt by a group of men (called the Kaneshie Boys) who removed Mensah from Church leadership and changed the name of the organization to the Church of Jesus Christ. By the end of the year the LDS Church had ceased to function in Accra. For several years, Mensah attended a Pentecostal Church while sleeping and teaching at the Brotherhood of the Cross and Star. The Brigham Young Institute ended with Mensah’s disengagement from the LDS Church. In fall 1978, LDS missionaries Rendell Mabey and Edwin Cannon and their wives arrived in Accra to establish an officially-sanctioned LDS presence in Ghana. Mensah began to attend LDS services again but William Johnson persuaded the missionaries that Mensah sought only personal gain through his affiliation with the LDS Church. Unmarried, affected with a congenital neuromuscular disease, and embittered, Mensah left Mormonism permanently in the early 1980s. He died in Accra sometime in the 1990s. Emmanuel Kissi, Walking in the Sand: A History of the Church of Jesus Christ of Latter-day Saints in Ghana (Provo, UT: BYU Religious Studies Center, 2004); Russell Stevenson, For the Cause of Righteousness: A Global History of Blacks and Mormonism, 1830-2013 (Salt Lake City: Greg Kofford Books, 2014); Russell Stevenson, “’We Have Prophetesses’: Mormonism in Ghana, 1964-1979,” Journal of Mormon History 41, no. 3 (July 2015): 221-257.